In just 9 days, the premiere MMA promotions in Chicago will host the biggest event to kick off the summer early with FIGHTCARD62:VICTORY. Putting on the best events in the area, FightCard looks for upcoming fighters to display their talents in front of their loyal fanbase. Whether a veteran fighter looking to make it to the next level, a "Rise Of The Gladiator" contestant looking to get the experience or someone stepping into the cage for the first time, knowing this moment will change their life forever. 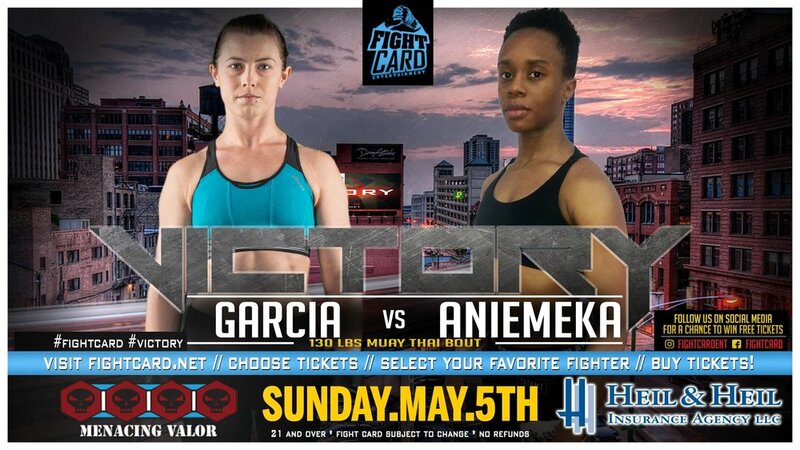 On May 5th, Amanda Garcia will make her Fight Card debut against another first time fighter, Ifu Aniemeka, as both look to make a statement to the other fighters in their division, "I fight because it's what I love to do, no matter where life takes me, I always find my way into a fight gym. I'm happiest when I'm training and striving to be a better Martial Artist." Training out of Victory Martial Arts Forest Park, Garcia carries the Fighter Nickname of "9 Lives", "...Because I just keep coming back" she laughs, "I've had a lot of setbacks but I've finally made it. This fight for FightCard is incredibly important to me. It's my debut as a fighter." "This fight is for my husband, Cesar Garcia (also a FightCard Fighter) who was the first person to believe in me and support my dream and for my brother, Terry Lisk, who gave his life protecting this country so we can ll pursue our dreams." Garcia states. Lisk and his unit was hit with indirect fire during combat operations in the volatile Anbar province west of Baghdad in 2006. Amanda has a Tae Kwon Do background and trains in Boxing & Muay Thai. Her match against Aniemeka will be a Muay Thai Kickoxing bout at 130lbs. "If it weren't for the headgear, I'd win by knockout with spin kick but I guess I will have to go all 3 rounds and win on points." This match up will have Forest Park native, Anna “The Honey Badger” Somers coming with a current streak of 2 wins to take on New Mexico’s striking undefeated fighter Shania Arredondo. Training with Team FITNHB, Shania comes off of two TKO finishes to her last opponents as well as a cancelled bout from last March. “I love fighting….I’m good at it” Arredondo smiles. With a balanced background in boxing, wrestling, BJJ and Muay Thai, Arrendondo plans on leaving Chicago with more baggage when she looks to bring the title to her hometown of Belen, NM. “This fight is very important being Fight Card’s 1st Women’s Title. It’s going to be fun and should be a good fight with Anna (Somers). I know she must be a tough if they’re bringing an opponent from out of state but I’m going to finish her one way or another.” Arredondo states. Some people have to search long and hard for motivation, this is not the case for professional fighter Miguel Luis. Chicago’s own Luis is in a perfect place in his life right now, all cylinders are firing, and on November 19th Miguel plans on all his hard work to pay off in a big way. Sometimes, timing is everything, as it would turn out Feroz Khan was just graduating high school as the UFC and MMA were exploding with popularity. Khan is a true go getter, he has worked for everything he has, and on November 19th he looks to show everyone that he is here to stay. With the Holiday season right around the corner Chris Bello plans on giving himself an early Christmas present this year, a victory at Takeover 2017. Having worked out the wrinkles, Chris is ready to show everyone he is a real threat in the lightweight division. On November 19th he gets his chance.